Just saw a bull terrier puppy for sale, and now you’ve melted into a puddle? We understand. The permanent smile and endearing antics are almost too much for anyone to handle. A wonderful family pet, this dog is about as good as it gets, and it’s not hard to see why. But here are four reasons anyway! Resisting the smile of a bull terrier puppy for sale is not a task for the faint of heart. Bull terriers have an incredibly unique, charming smile that makes them instantly recognizable among dog breeds—not to mention the egg-shaped head that you won’t find anywhere else. These traits came about from blending the old English bulldog, old English terrier, Staffordshire bull terrier, Spanish pointer, and other breeds to create the sweet bull terrier that we see today. “Man’s best friend” is a phrase that embodies what bull terriers truly desire. They are happiest when they are romping with their family members, doing whatever activities their owners are doing. Alone time is on their list of things they’d rather not do, and they need early, consistent socialization to develop a good attitude towards pets that don’t belong to their family. Without persistent socialization, your puppy will develop a deep loyalty for you, but might also develop aggression issues towards other animals and pets. It’s not uncommon to hear this breed described as a “three-year-old in a dog suit.” The antics of a bull terrier, especially in puppy form, are endlessly entertaining. These dogs have a need for intense daily exercise to get their energy out, and love to play with children, though their size and strength make them best for families with older kids. Like children, bull terriers need a firm, positive approach to training to ensure that they learn which behaviors are appropriate from a young age. Introducing boundaries and rules early on will make living with a robust adult bull terrier much more enjoyable. If cute and irresistible are your thing, but you’re not that into white, you’re in luck with this breed. Bull terriers come in a variety of coat colors and patterns that only add to their phenomenal personalities. Originally bred to be entirely white, the bull terrier was bred with Staffordshire terriers to introduce colors to the breed, because of the tendency for deafness in all-white puppies. 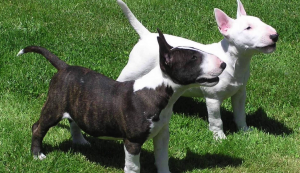 Today’s bull terriers still come in white, but now also come in black, tan, red, brindle, and many combinations of these colors. With so many good points, it’s totally understandable why you’re obsessed with this breed. The unique and adorable body shape, endless devotion to its owners, and general love of life (and fetch!) make it obvious why so many people are seriously considering the bull terrier puppy for sale as their next companion. And as long as you have the leadership and time to spend on exercise, training, and, of course, those sweet puppy snuggles, your next furry companion is going to be ecstatic to meet you!